From 2014, the editorial board of the Military Technical Courier resumes the editing and publishing of a special supplement-section entitled Military Economy Survey. This supplement is going to be published annually, in issue No4 (October-December) in every volume of the Military Technical Courier. Contributions from the field of economy, namely quartermaster and financial service, will add value to the logistics sistem support offered by the Military Technical Courier to the members of all branches and services of the Ministry of Defence and the Army of Serbia. The Military Economy Survey section will also be open to contributions from academic circles, in line with the editing conception of the Military Technical Courier. 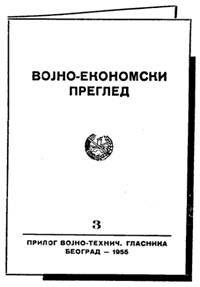 After being published as a supplement in the Military Technical Courier from 1953 to 1956, the Military Economy Survey used to be issued as an independent publication from 1957 to 1979 when it changed the title into Logistics and continued to appear until 1992. The editorial board of the Military Technical Courier calls contributors to quantify their individual scientific and research results with their scientific and professional papers in the Military Economy Survey section. This will also help toward further improvement and influence od the Military Technical Courier – multidisciplinary scientific journal of the Ministry of Defence of the Republic of Serbia. The first renewed Military Economy Survey supplement is to be issued in No4/14 of the Military Technical Courier.